By Leanne Tan in Internet. Updated on November 19, 2017 . One of the best things about Gmail is the threaded conversation feature. It helps reduce clutter, particularly for busy people who use email a lot in their business dealings. Achieving Zero Inbox is a daily struggle for many, and one of the best way to still keep your emails in your inbox without adding confusion to the mix is the art of archiving. Although archiving on Gmail is easy with its "Archive" button, it can get a bit tedious if you have to do all your archiving in one go. But did you know that you can archive emails when you click your "Send" button? This helps you actively springclean your inbox as you use it, leaving less of a mess and a more organized mailbox in the long run. To set this up, you need to enable the “Send & Archive” button in your compose window. Click on the button at the top right and go to Settings. Next, scroll down until you reach the “Send and Archive” category. Select the “Show ‘Send & Archive’ button in reply”. Make sure to save your settings. To do that, scroll down and click on the "Save Changes" button. Now when you reply to your emails, you will see a “Send & Archive” button next to the "Send" button. When you want the option to archive your email conversation, you can choose the Send+Archive button instead of the regular "Send" button. In case you accidentally archived the wrong email thread, you can click the Undo link that will appear near the top of your inbox right after the message has been sent. Alternatively, you can choose to move the thread back to inbox. To do that, go to Sent Messages. 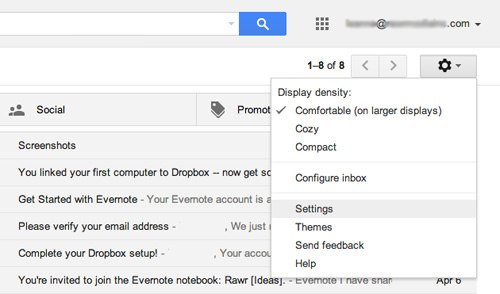 Select the conversation you want and click the "Move to Inbox" button at the top. If you are concerned that you won’t receive future emails from the archived conversation, don’t worry. Archiving your emails will not affect future incoming messages to an archived conversation. New messages in an archived conversation will still pop into your Inbox.